You can expect two interesting things in this text : We are going to create 3D molecules and we will try - once again - to move 3D objects to be in front of screen. Install the program and run it. Just short explanation: Atoms are the small color spheres - more connected spheres/atoms create a molecule. User interface of Atomsmith software is quite easy to understand. In it's central part you can see a window used to show molecules; under this window there are buttons you can use for example to move, rotate and magnify your molecule. On the right side you can choose more "advanced" functions. For start we will use standard settings of Atomsmith. Load a molecule - we recommend for example 1Propanol (File/Open Model/Alcohols/1Propanol.amol2). Rotate it as you wish (use the button with a circle and an arrow), move it to the right side (use the button with lines and arrows). Save the picture (File/Export Graphics) as the left one. Now shift the molecule to the left - by 1/4 or 1/6 of the screen. And save it again as the right picture. Now start 3DJournal software and load the left image and the right image. It'll be useful to set the picture as black/white (standard colors of atoms aren't very good for anaglyphs) and create 3D picture. It's a good idea to let a wide black border on your picture with a molecule. Why? Because you can use it for 3D experiments. Move the picture horizontaly to set the front atoms (spheres which are nearest to you) of left and right images to each other. Your 3D picture should seem to be behind the screen. And now try to shift the pictures to overlap the farest atoms. 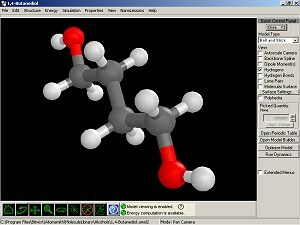 You can see (with 3D glasses) the molecule in front of your screen. Now shift the pictures as you wish - one part of the molecule could be in front of the screen and the second part behind it. Remember - no object on the picture which should be in front of screen may cross the border of the screen - and the screen should be big enough to give the objects good chance to arise from the screen. We can't write about all the functions of Atomsmith software here, but we would like to let you know a few more things about it. The standard setting for creating annaglyphs, which is useful to know, is: Projection/Perspective, Model type/Ball and Stick and Color/By atom.